Our purpose built holiday home is located in the heart of One Tree Point, very close to the Marsden Cove waterways and marina development. 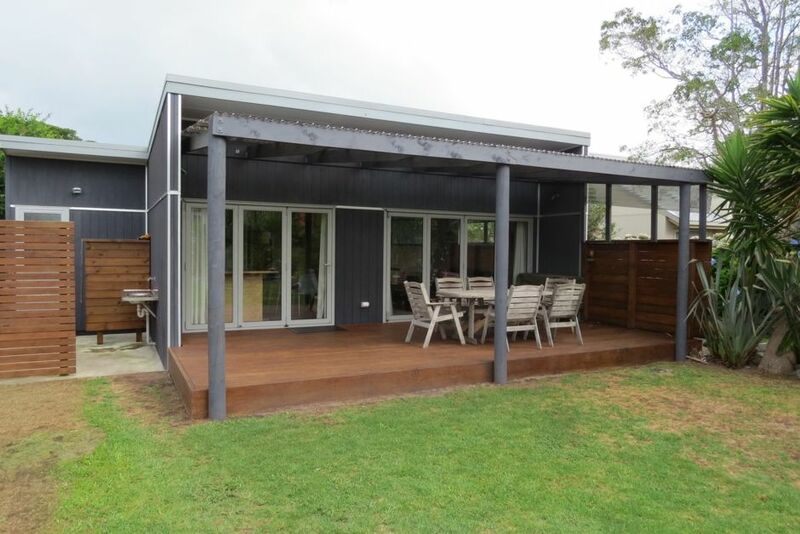 Nestled near the end of a quiet cul-de-sac on a very sheltered section, it is only steps from a beautiful safe swimming beach within the Whangarei Harbour. The Bach sleeps 6 with a maximum of 4 adults, it offers plenty of off street parking, and is equipped with a handy hot/cold outdoor shower for easy sand removal after a day at the beach. One Tree Point is a fabulous beach side holiday destination located half and hours drive south of Whangarei, and only 90 minutes drive from central Auckland. Located near the entrance of the Whangarei Harbour, it offers easy launching and safe boating all year round and many safe swimming locations. Facilities within easy walking distance of our bach include a fabulous waterside cafe, liquor wholesaler, hair and beauty therapist and local dairy. A childrens playground is close by and we are only a few minutes drive from the Ruakaka shopping centre. Duvets and pillows are provided on all beds, but bring your own sheets, pillowcases, towels and teatowels. Smoking allowed outside only leaving no evidence. No extra overnight quests without prior approval. Seperate toilet, bathroom combined with laundry. Welcome to park on the lawn. Boat parking on lawn. Small plug in oven available. Tennis court at School around the corner if net is set up. Outside only, with no butts left behind please. Clad to hear you enjoyed your time at our family Bach, unfortunately you must have misread the ad and the bach instructions I sent regarding cleaning the Bach when you depart. You have cleaned and tidied nothing and walked out like it’s a motel. Would like to come back again in the future. Thanks. Awesome bach all the comforts of home we were very impressed. Thanks for a lovely stay. We loved our stay thanks! Perfect option for 4 of us. Great location in quiet street. Room for 6m boat and car on section. Marina access 2 mins drive away. Lovely little Bach with excellent facilities. Would definitely stay again.